The Italian luxury house unveils a fully personalised Serpenti timepiece. Italian luxury house Bulgari has turned its attentions to the Millennial set, hoping to lure them in with a fresh, signature Serpenti watch model, which is fully customisable online. The Serpenti, which was revived by the brand in 2010 as a steel watch, has now found new life as a quartz ladies' watch is available with a choice of 13 colored detachable and interchangeable calfskin or Karung leather straps, 12 dials and four cases for a total of 312 possible options - which, additionally, can be personally engraved. The timepiece will retail from US$3,850 ($5,390) for the steel version without diamonds to US$9,700 ($13,580) for the gold version with diamonds, with customers able to personalise their own Serpenti using a dedicated app installed on a tablet, available in a select number of brand boutiques. 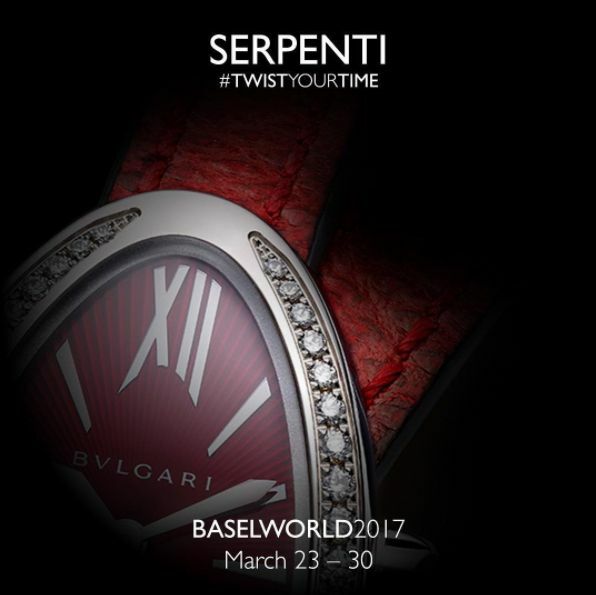 The timepieces, which are to be unveiled at the Baselworld watch and jewellery fair this month with the hashtag #TwistYourTime, will go on sale in May with the launch aimed at garnering further appeal from a younger demographic.